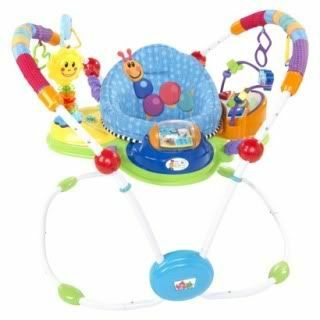 When Hailey was born, we registered and were gifted a Baby Einstein Musical Motion Activity Jumper at our baby shower. She didn't really start using it until about 4 months when she could really hold her head up and balance. Well, now that she's almost 9 months, she still likes playing with it, but she just rather be on the outside walking around it, instead the inside. Even though the seat swivels and she can reach everything on the play set, she doesn't like being restricted anymore. Go figure. Don't get me wrong, she and us got our fair share of use out of it for the last 5 months or so, but now just like many baby items, she has out grown it so fast and now is more interested in other things. Since she is standing most of the time now, I popped into Once Upon a Child last week to just look at some toy options for her. 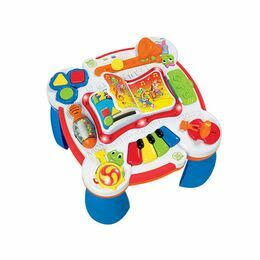 I got this LeapFrog Learn and Groove Musical Table for $7. 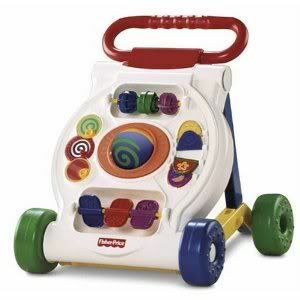 I don't know if the sound actually works, yet ( I need to flip it over and put batteries in it), but even if it doesn't, it still keeps her entertained and for how cheap it was I just couldn't pass it up. They run $40+ brand new. What a deal, right? I'm sure in no time, she will be over this and onto the next thing anyway. I keep this one at my parents house, cause I bought a different (brand new) one at Target. I haven't opened the one from Target. It was about $26, which isn't horrible for brand new, but we will see. I just hate spending so much on these things, when I know that 2 months from now (or less), she will be over it and onto bigger and better things, right? I guess that just comes with the territory of having kids though. Thank god for garage sales, consignment shops and other places like Once Upon a Child. New toys can be such a rip off! I tagged you in a post, check it out!